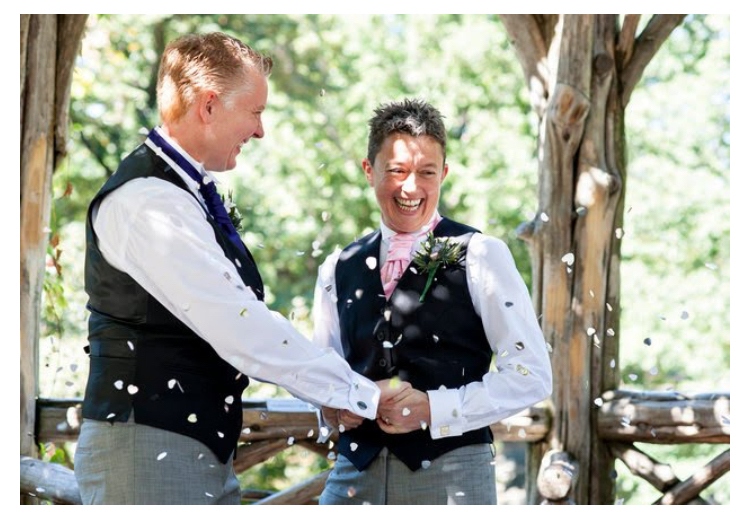 Don’t Stress when thinking about what to wear for your LGBT+ Wedding? Let’s talk about a crucial factor of your Wedding Day – what not to wear, but most importantly, what to wear for your big day. Number one, and for me, it’s probably one of the most important, is whatever you choose to wear on your big day, it’s got to suit you and your personality. If you absolutely despise wearing a suit, and you wear a suit for work every day and can’t wait to get out of it, or you find it constricting, please don’t wear one on your wedding day. It’s got to be right for you, it’s got to suit your personality, and it’s got to suit your style. If you are ’50s chic, go for ’50s chic in your wedding day. If you are ultimate glamour, do that for your wedding day. The list is absolutely endless, and the possibilities are huge. It’s really got to suit your personality and who you two are as a couple. If you are fun loving, gregarious, outgoing, let’s make your outfits say that. If you’re quite reserved and quite demure, then your outfit should say that, too. So, it’s really, really got to suit your personality, your style, and really communicate who you both are as a couple. Number two, the two outfits you choose really should complement each other. The photographs that will be taken on the day, you’ll have with you forever you want to look like you ‘belong’ together right? These photos could be gorgeous to look back on in the future, but not so much if the two outfits don’t suit each other -cringe! So, it’s really important you chose colours carefully also, if you don’t want to see each other’s outfits, choose an intermediary that can picture both of them and can make sure you’re both on the right track. Whether that be your wedding planner or whether that’s one of your best people, pull someone in, and get them to see both outfits just make sure you complement each other. Make sure your colours are in the same palette; that your hues are complementing each other. If you’re both going for lime green, make sure they’re the same or a very similar lime green. Otherwise, it’s not going to work, and it’s going to look awful. Bright colour – don’t be afraid of colour, and who’s to say you must have white, or grey, or navy. Definitely, a pop of colour can make the wedding look amazing. But you’ve really got to be careful and make sure you’re complementing as a pair. 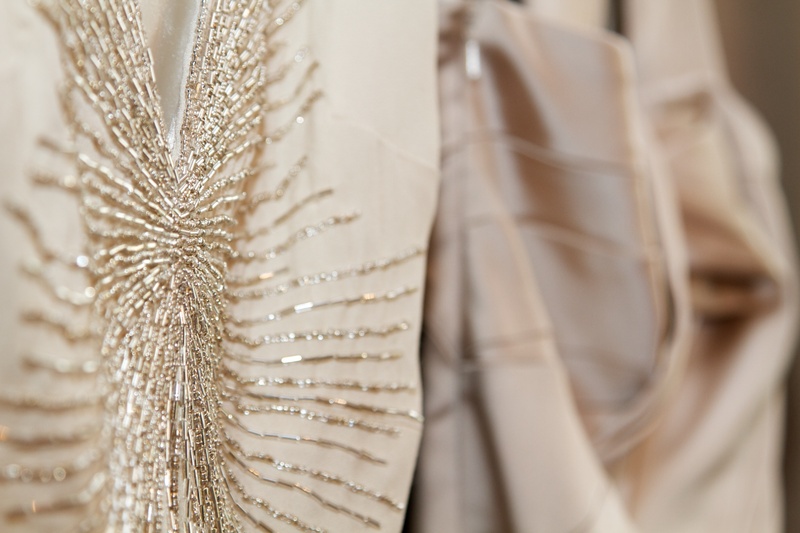 Third tip, make sure that your outfits complement the venue that you’ve chosen. If you’ve gone for something on the beach, that’s really light and romantic, you don’t really want stuffy and constricted outfits. They’re really going to jar with the look and feel of your wedding, so try and make sure it fits in. Equally, if you’ve gone for somewhere uber posh, you’ve gone for a high-class hotel with amazing service, and you’ve got amazing rooms, incredible food, shorts and flip-flops are probably going to jar a little bit. That’s not to say you can’t dress down a suit and make it more comfortable, make it more you, but just think about how you’re going to sit against that backdrop of your stunning venue choice. Lastly – as bonus tip – your outfits have got to fit you! Not just being the right size off the peg, but truly fit you, be shaped and hug/ cover all the right bits. Set aside some extra money in your budget not only to purchase your outfits but to also get them tailored, to that end I’d recommend suits are tailored two weeks before the wedding. Make sure that the trouser length fits with the shoes you have, that the sleeve length fits with the shirts you have chosen, that the shirts are even fitted properly. They will make all the difference on the day. It’ll mean you don’t stand here fiddling around trying to adjust, or trying to untuck or re-tuck. They’ll just make that you are looking effortlessly amazing in every single one of your shots, and all throughout the day. If you’re having a dress fitted and altered, most tailors and seamstresses will need about six weeks to do that, so make sure you’ve scheduled that time into your planning and really try hard not to lose or put on any weight in those last couple of weeks, don’t think scales – think tape measure and inches! It’s really important that you try and stay steady so that your outfits fit you perfectly. There are loads of cheats we can use around outfits as well. To make sure that your top’s not going to fall down, or to make sure that that top button stays buttoned. To make sure that your handkerchief sits beautifully in your pocket. To make sure your flowers stay fresh. Whatever it is you want, give me a shout, and I’m happy to share some tips. Your tailor should be able to help you, and quite often the photographers will know a few sneaky tricks as well. But don’t be afraid to use double-sided tape either. I’ve saved a lot of people’s outfits with double-sided tape and emergency stitching. Lastly, whatever you wear on your day has got to make you feel like the best you. The best version of you on your very best day. Whether that’s feeling beautiful, glamorous, whether you feel your most powerful and strong. Think about what you look like on your very best day, and that image will be you on your wedding day. All of that will be assisted by an outfit that fits your personality. Something that complements the person you’re stood next to, who you are making vows to. Something that fits your venue, and it fits your body. It is tailored well, and it’s not going to shift anywhere. That’s how you will feel the best you on your wedding day. You can download a free planning and budget sheet on the website, absolutely free. If you have any questions or content suggestions, please do get in touch. Hope that helps. If you want more hints and tips, pop over to Instagram. We’re on Facebook, and we’re on Twitter.